I’m sure when the phrase ‘you’re never too young to start learning’ was coined, the creator didn’t have this children’s board book series in mind! 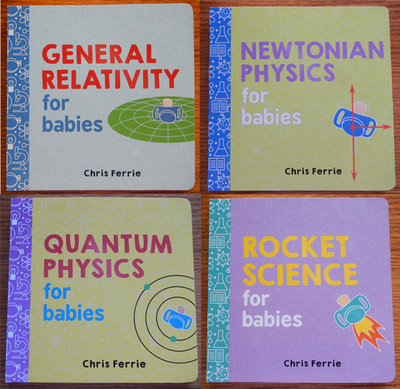 Created by physicist and mathematician Chris Ferrie, the Baby University series takes learning to the extreme for its young audience. This series aims to introduce babies and toddlers to complex scientific ideas using simple explanations, kick-starting their learning processes and helping to create little geniuses. Ferrie uses a ball in each book to explain different practices and ideas, such as gravity, mass, force and acceleration, among other scientific notions. While I personally think that this series is beyond the grasp of understanding for such little minds (and even the bigger minds reading it out loud to their children!) I do think that it is a unique concept, and one that some parents would embrace wholeheartedly. The illustrations of the ball that are used to explain each theory are easy to understand, with arrows, coloured text and simple diagrams helping to get the point across. This is certainly an interesting series and there are already quite a few books available (pictured above are only four of the titles). If you want to accelerate the scientific or mathematical mind of a young one, then this could be just the series you need.